So for the last couple of days, I have been working on a Series of posters about men with epic Mustache’s. And It just so happened that while I was working on Earl ( Jason Lee ) I saw on twitter that “My Name Is Earl” my favorite show, had been canceled via @WilfridDierkes aka MNIE show creator Greg Garcia. Needless to say I was Pissed! After more investigation, I found out that ABC or FOX might be interested in the show and that they had created a twitter petition @earltwitition which is quit possibly the first of its kind. So being the huge fan I am, I took which was the weirdest coincidence ever, and turned it into a SAVE EARL poster to try and help. If you watch the show its all about Earl’s list of things he has done wrong in his life and is trying to fix one by one. Which is why I chose to present the illustration on Yellow Crumpled up paper. Turned out pretty good I think on such short notice. For once I was ahead of the eight ball and I’m not gonna let it get away. So here it is, DOWNLOAD IT, Print copies and post it around the office and most importantly the web. Greg Garcia (Show Creator) is sending every tweet and re-tweet to NBC, ABC, and FOX in hopes of turning the tide. And hopefully, he will be stoked when he see’s the direct message from twitter with the link to this poster in it… cross your fingers and hope he is stoked. Over and Out… TRON. 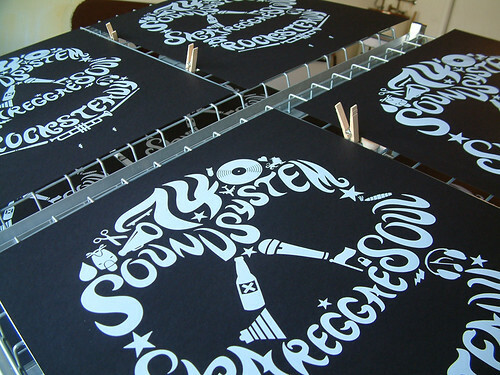 In The Meanwhile, Check out the 74 Soundsystem on their myspace page and rock some BASS! 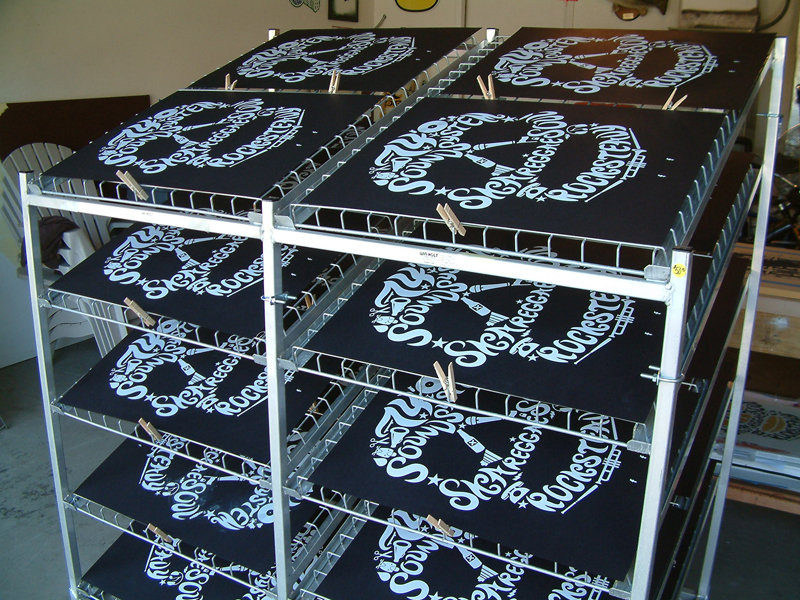 Just as promised, here are all the pics from the printing session and a link directly to the poster in our store. Just a Reminder, these prints are limited to an edition of 50 and we are definitely not printing it again…ever. 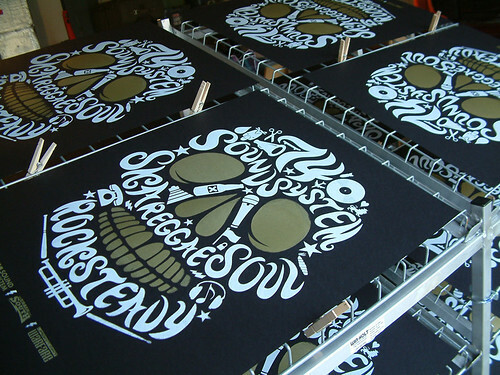 If you need another reason to purchase one of these bad boys, just remember they are hand screened 2 color posters printed on 80lb cover with white/gold ink at 18 x 24 inches. 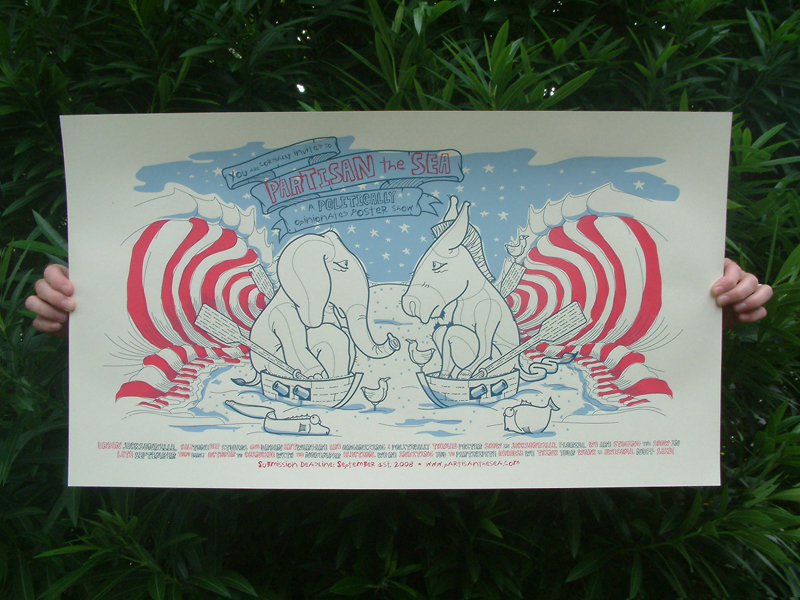 All these posters are one-off prints which means each is a one-of-a-kind. Due to the nature of the screenprinting process, little imperfections and blemishes are inevitable. Before it joins the rest of the edition, each print is inspected to make sure its meets our quality standards. All prints are signed, stamped and numbered by both Tron & Grease. If you just want to take a closer look a the print, check out the whole set on our HTD flickr account. Heads Up Kids! 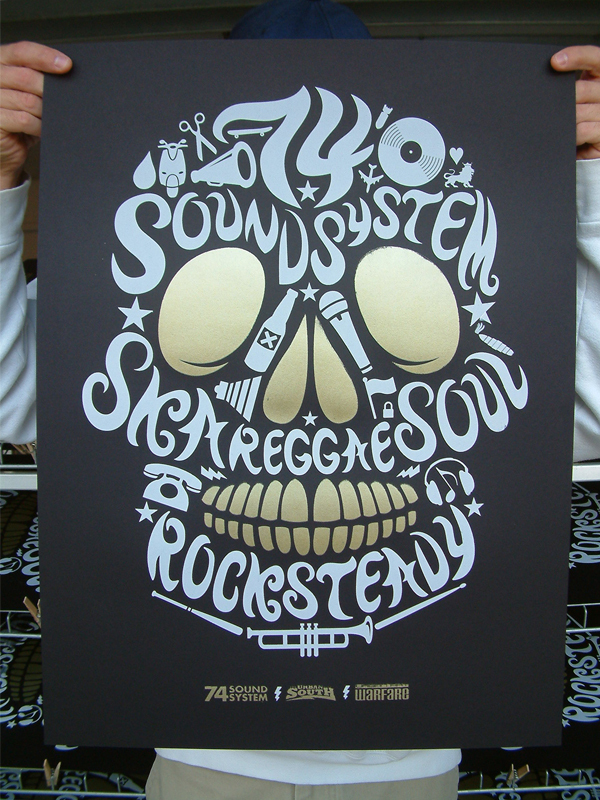 We have had such an overwhelming response to the first version of the 74 Soundsystem skull print that we have decided to reprint it in a different color combo. And now that I have laid this one out, I kinda wish I would have done it like this first. I just have a soft spot for khaki paper. But thanks to the many people who posted version one and said such nice things, we will have the Back In Black version ready for purchase here in just a few days. And for those of you who emailed me about the print don’t worry, I have set aside one for each of you and I’ll be contacting you shortly. I will also have photos of the actual printed poster and more from the session here shortly as well. You know what, all I’ve really accomplished in this post is telling you that Im GONNA do stuff. Alright, I’m on it! — Tron Burgundy. Check it out on gigposters and leave us some feedback dammit! 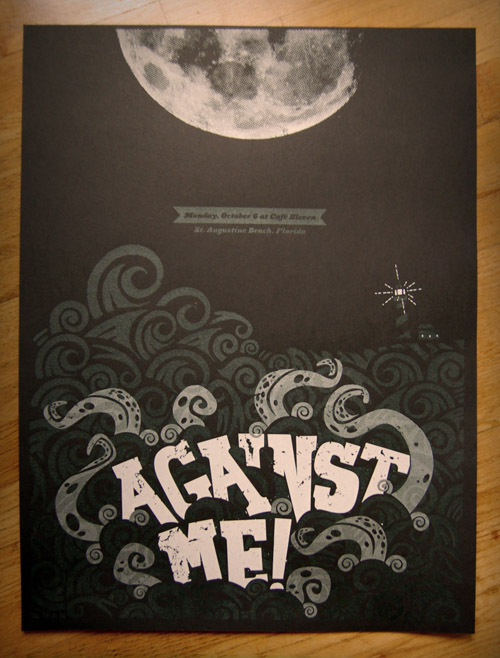 If any of you are curious at all as to what the process of actually screen printing a poster looks like, here are some step by step pics of the Against Me poster we just did with Dog and Pony. Its not exact procedure but you will get the idea of what goes into it all. Bet you didnt know it was straight SCIENCE huh? Emulsions, burning, inks, reclaiming, and all that jazz. But its all worth it in the end to see silver and white ink on black paper. So fresh! Thanks for posting the pics Mr. Tucker. Whole new batch of pics are posted over on the Halftone Def Studios flick photo sets. They are photos of pretty much the whole process from start to finish with the exception of the films and the sketches. You can see the ink mixing, screens, us printing them color by color, detail shots, The Rad 2 color stamps, us packing them up in tubes, and Grease in the bushes with crazy hands.